MIAMI — What turned most people on former Miami Dolphins head coach Joe Philbin was a lack of results with perhaps the best roster he’d coached during his tenure with the team. The new Miami Dolphins coach agrees that talent is not their problem. Dan Campbell thinks the Dolphins need a more aggressive, intense, competitive environment, and he plans to provide it. Campbell was promoted Monday from his job as an assistant when the Dolphins fired Philbin four games into his fourth season. 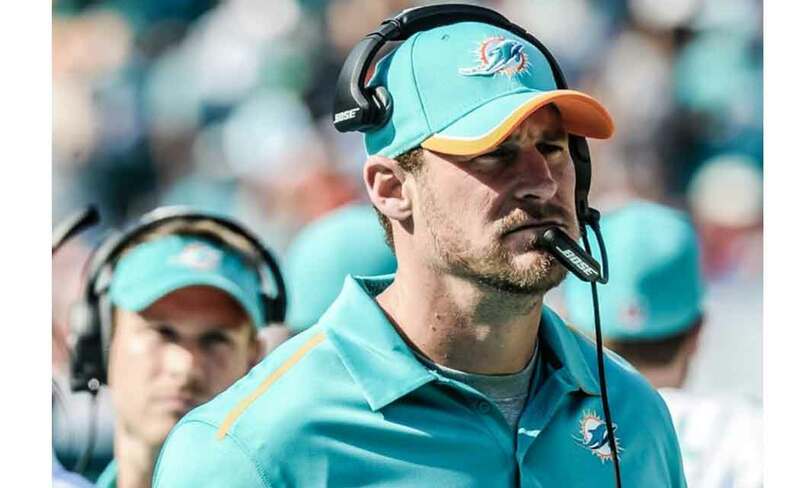 Campbell’s only coaching experience is with the Dolphins, who hired him as an intern in 2010, and he has been their tight ends coach since 2011. Campbell, a former NFL tight end, said the prospect of replacing Philbin and becoming a head coach was “a little surreal.” But he expects to retain the job beyond his interim stint. Campbell said the Dolphins (1-3) need to show more aggressiveness, stopping just short of dirty play, and he looks forward to breaking up a few fights in practice. His passionate, fiery demeanor is a big change from the even-keel Philbin. “My vision is a bunch of hard-nosed guys that go out every day for practice and are ultra-competitive,” Campbell said. “These are guys that are scratching and clawing, very intense, very heated, and on Sunday it’s that same team. Owner Stephen Ross fired Philbin one day after a flop on an international stage helped seal his fate. The Dolphins lost their third game in a row Sunday with their fourth consecutive lackluster performance, a 27-14 loss to the archrival New York Jets in London. Few will accuse Ross of impatience. He ignored calls to fire Philbin in December after the team faded to finish 8-8 for a second successive season. Doubts only grew this season regarding Philbin’s ability to motivate players. Campbell lists Sean Payton and Bill Parcells as mentors. His relationship with Payton dates to 1999, when Campbell was drafted by the New York Giants and Payton was on their coaching staff. Campbell said he wasn’t ready to make any decisions regarding possible changes in the rest of the coaching staff, which includes embattled defensive coordinator Kevin Coyle. Miami has a bye this week and next plays at Tennessee on Oct. 18.